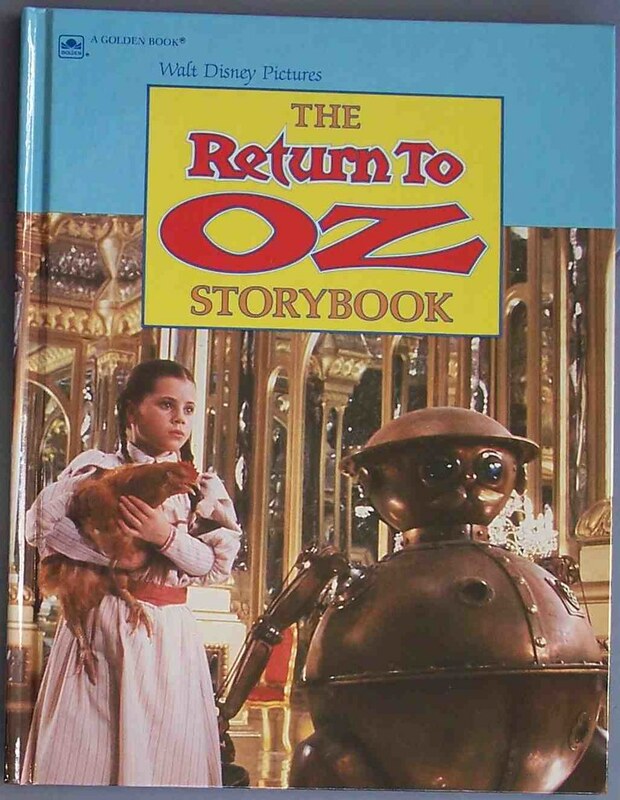 In my article about adaptations of The Marvelous Land of Oz, I mentioned that the 1984 movie Return to Oz was an adaptation of two of the Baum Oz books. Specifically, it’s a combination of Oz books 2 (Marvelous Land of Oz) and 3 (Ozma of Oz). 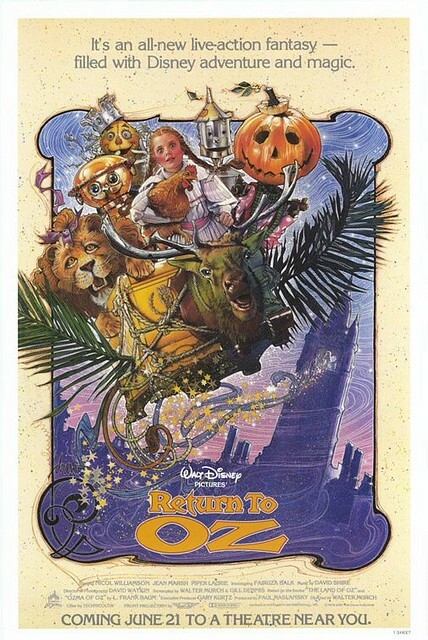 After finishing Book 3, I decided to re-watch Return to Oz the other night for the first time in maybe 10 years. Since it’s sort of a cult, underground hit, I thought I would give it a quick review for you guys. So, WOW, the first twenty minutes of this movie are DEPRESSING. This movie starts a few months after Dorothy has returned to Kansas. The farm is destroyed from the twister. I mean, everything is in shambles. Uncle Henry and Auntie Em are trying to rebuild everything. Uncle Henry broke his leg and now just sits around drinking all day doing nothing. Em is stuck doing all the work. Everytime Dorothy brings up her trip to Oz, Em just shuts her down. No one believes Dorothy’s trips were real. She’s starting to believe they weren’t real. Em takes Dorothy to a “mental hospital” to have a psychiatrist take a look at her. The psychiatrist actually intends to hook Dorothy up to a machine for shock treatments. SHOCK TREATMENTS. This movie was actually showing Dorothy in this creepy old asylum about to have her head lobotomized. I didn’t remember any of this and started to question whether I actually wanted to finish the movie. So I continued on, Dorothy is saved by a mysterious girl and runs out of the asylum into a thunderstorm. Dorothy is knocked out and wakes up back in Oz. The movie essentially takes the framework for the third book, Ozma of Oz, and adds the characters from the second book, Marvelous Land of Oz. The main changes to the story in Ozma for the movie were to remove everything having to do with the fairy Land of Ev. All of the events in the movie happen in Oz. And not just Oz, but a dilapidated, ghost town of Oz. Also, while they appear on the poster, the Scarecrow, Tin Man and Cowardly Lion are relegated to cameos at the end. The other 15 characters in the poster above were given all the screen time. Another change is that Mombi is the main villain (and the current ruler of Oz which is why it’s so run down). We do get to see the awesome Nome King from Book 3, however he looks like Ice Man from the pilot of Misfits of Science. And although he’s the King of the Nomes, you really don’t see any other Nomes. He’s a king of one, I guess. He’s the one telling Mombi what to do. The game the group plays against the Nome King at the end of Book 3 where they are turned into ornaments in his palace remains the climax of the movie, but the origin of the King’s powers, a magical belt, has been changed to the Ruby Slippers from the 1939 MGM movie. And yes, the Nome King actually wears the Ruby Slippers (and looks completely ridiculous). I find that little change odd because they didn’t really follow the design elements of the MGM movie for anything else. It seems weird that they would want to stick with the ruby slippers but change everything else. I don’t know why it couldn’t have stayed a magical belt. But that’s neither here nor there. Dorothy figures out the Nome King’s game and saves everyone. The group travels back to Oz, saves the people of Emerald City who had been turned into stone and they throw a celebration. The new ruler of Oz, Ozma, is revealed to be the mysterious girl that saved Dorothy in the beginning and she sends Dorothy home with the shoes. When Dorothy gets back to Kansas, everything is better and it’s like nothing had gone wrong. I guess it was Dorothy making everyone miserable. Overall, this movie was a pretty good amalgam of the two books. I thought the design of the world and characters were well done. Tik-Tok was awkward, but he mostly worked. 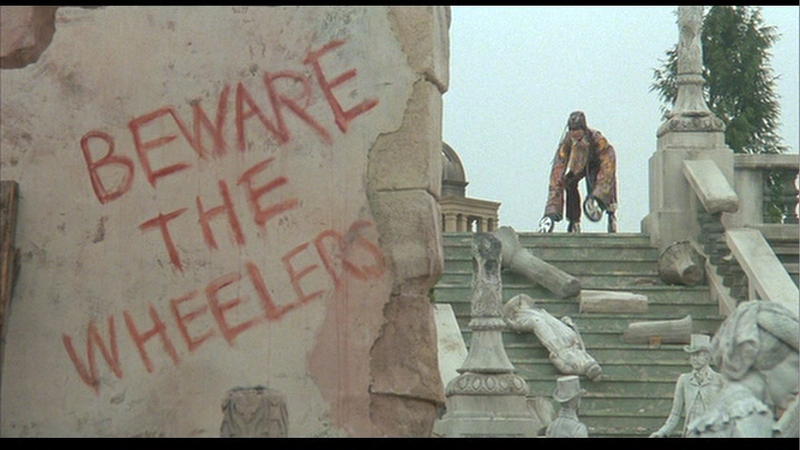 The Wheelers were a lot of fun and really underused. The scenes with the Nome King were a little psychedelic and weird. It was like a David Bowie video. I enjoyed him much better in the book. However, overall, this was an interesting movie. I didn’t love it, but I definitely thought it was entertaining. But you definitely have to soldier through those first gut-wrenching 20 minutes until Dorothy actually “returns to Oz”. I talk more about this movie on episode #38 of the Cult Film Club podcast. This entry was posted on April 20, 2012 at 9:30 am and is filed under movies, pop culture, Wizard of Oz with tags books, movies, Oz books readthru, pop culture, reviews, Wizard of Oz. You can follow any responses to this entry through the RSS 2.0 feed. You can skip to the end and leave a response. Pinging is currently not allowed. I didn’t remember seeing this until you mentioned TikTok. But labotomy? Seems a bit dark for Disney. Eeeeep! It’s been YEARS since I read Wizard of Oz. Don’t think I’ve read any of the others. Pax, I saw this in Radio City Music Hall when I was a kid for its premiere. It was so awesome. I actually love this movie and hold it right in the same spot as Labyrinth. 2 of my favorite 80s fantasy films. I could see why it was tough for you to get through but when I was a kid I loved creepy stuff like this and the shock treatments, the lights flickering, the nasty woman who ran the asylum, the wheelers all made it very creepy and I just ate it up when I was a kid. It was so different than the cheerful MGM Wizard of Oz – which I also love don’t get me wrong, but much thought it was cool that they risked going with a darker tone which is more representative of the books. While the first 20 min were tough to get through, I loved the rest of it. And, honestly, the books aren’t that dark. The movie takes it’s own track with the demolished Oz and mental hospital scenes. 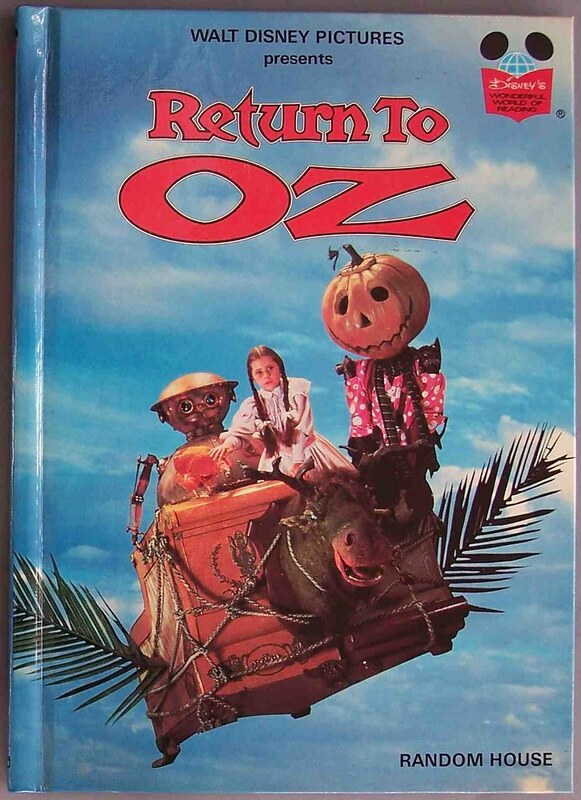 I just read the two books this movie was based on and while they aren’t as rainbow-y as the MGM musical, they are nowhere near as dark as Return to Oz. But I still enjoy the movie. It always seemed like I ONLY remembered the first 20 minutes, rather than the fun and interesting stuff after it. It always went something like this in my head “Remember that sequel to Wizard of Oz where everything was horrible and Aunty Em put Dorothy in an insane asylum” beyond that thought it always just seemed like a bunch of nightmare imagery, severed heads, mutant gangs, a broken up yellow brick road…kind of Mad Max of Oz… I might have to give this movie another shot, after all, I do love weird. Great write up Pax!